I would wager there are no other Spurs basketball fans reading these words, so I will mercifully continue the discussion of the NBA Finals after the jump. Note: The original post had identified the Rock and Roll Hall of Fame building as Cleveland Arena. I plead blindness brought on by how ugly the building is. The Rock and Roll Hall of Fame may well be the most hideous building I have ever seen. It's quite possibly even uglier than enshrinee Keith Richards. The only thing uglier than the Rock and Roll Hall of Fame in Cleveland (aka "The Mistake By the Lake") was the game itself. Almost unwatchable for three and a half quarters. 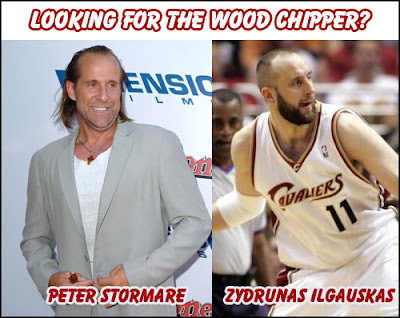 Is it just me, or is Zydrunas Ilgauskas the spitting image of the guy who feeds Steve Buscemi into the wood chipper at the end of Fargo? The "Era of King James" indeed. What-EV-ah! Excellent points Mr. Hartwell. The Spurs up 3-0 is indeed a beautiful thing. My favorite poster held up in the audience (I think during a highlight from a game in San Antonio) was one that said "What are we supposed to be witnessing again?" 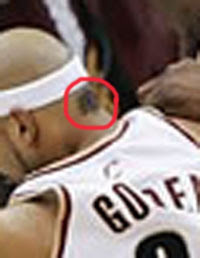 Don't get me wrong, I like LeBron a lot, I think he's not only a great player but an excellent ambassador for the game. But the hype can get to be way, way too much.